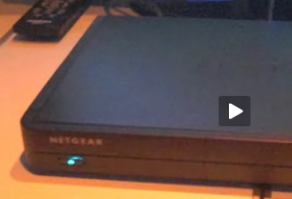 Our friends over at NewTeeVee got a glimpse last night of a new set-top box from Netgear that, amongst other features, can stream YouTube HD content directly to a high definition television. Dubbed the EVA 9000 Digital Entertainer Elite, the device is aimed at “the tech-savvy, early adopter, not your average Roku user”, reports NTV, and, along with YouTube support, can download BitTorrent files, access additional Internet-based content, as well as stream video from any PC connected to the same local network. Netgear hasn’t ruled out the possibility of Netflix streaming too. On the YouTube HD front, NTV says it looks “awesome” — see video below — and that overall the experience points to where the Google-owned video site is heading. Watching YouTube HD on a big screen, you get a glimpse at YouTube’s future: premium content from networks and studios delivered straight to your TV sans any cable provider. And it makes you realize why the company reversed its position on pre-rolls as they will look just like commercials on a big screen and probably be more tolerated since people will be in their living rooms.